Those words from Beyoncé, uttered midway through her festival-headlining performance Saturday, were less a humble show of gratitude than a declaration. 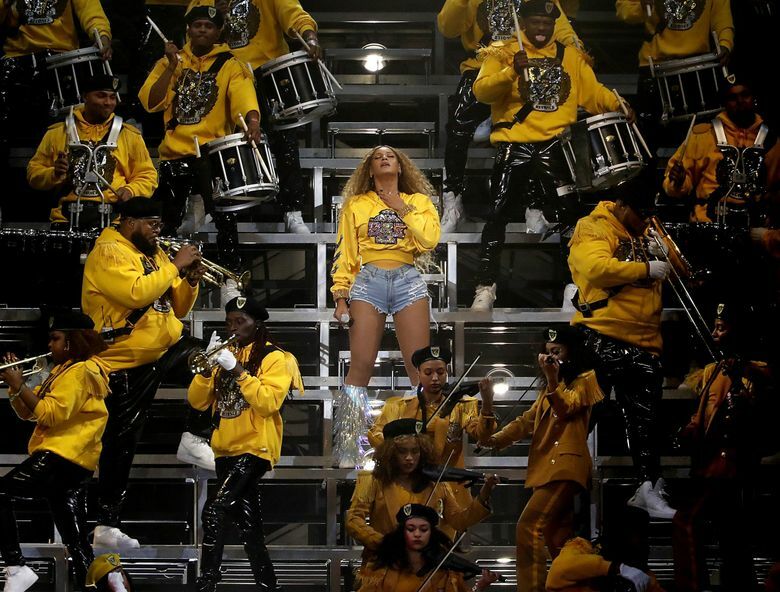 She interspersed her historically black college-themed performance – complete with drumline, majorettes and step-dancing – with a Destiny’s Child reunion and cameos by her sister, Solange and husband, Jay-Z. Thanks to the Coachella livesteam, which repeated the performance Sunday for those who may have missed the initial concert, people all around the world could watch along. It became a major cultural event, rivaling her 2016 Super Bowl halftime performance. While Beyoncé intended to entertain the live audience in Indio, California, the performance was clearly also meant to thrill an audience watching from afar. For her “Lemonade” tour, Beyoncé had elaborate set designs, featuring pools of water and video screens that breathed out actual fire. At Coachella, her backing of more than a hundred musicians and dancers in yellow and black, many wearing berets and placed in a pyramid formation on bleachers, was just as spectacular. Beyoncé had basically created her own HBCU: the University of Beyoncé. The school colors: yellow and black (the yellow, a theme from her album “Lemonade,” is also the color of her Beyhive horde of fans). The fraternity brothers’ clothes bore the same Greek letters as Beyoncé’s cropped sweatshirt: BDK, or Beta Delta Kappa. The B and K likely stand for Beyoncé Knowles, while the Delta may be an allusion to her favored number, four. She had reimagined some of her biggest hits as marching band renditions that could upstage any HBCU halftime show (the backing musicians included former members of Florida A&M University’s band, and the drum line was formally introduced as the only one presented by “Queen Bey” and “guaranteed to show up and show out.”) There was elaborate step-dancing. There was even a mock probate, a coming-out ceremony for Greeks at HBCUs. Jay-Z showed up for “Deja Vu.” Solange danced alongside her sister to “Get Me Bodied.” Les Twins, a dancing duo, appeared throughout. For “Drunk In Love,” Beyoncé stood alone atop a cherry picker and serenaded the audience. While Beyoncé was the first black woman to headline Coachella, other black performers have graced the main stage, including in 2010 when Bey made a cameo during Jay-Z’s headlining set. She had also been scheduled to perform at the music festival in 2017. She then went on to explain a bit of the genesis of the grand show. The hard work showed in her fierce dance moves, sweat dripping down her face and, yes, in the control of her vocals in the midst of her P90X-level performance. It also showed off in her creativity to celebrate and pay homage to something so integral to the fabric of black American life and history, in the least likely of places. This article originally appeared on washingtonpost.com. Read it here.